The modern day Edisons have done their job. We need not wait any longer. We are poised to wake up to a world running completely on renewable energy. Waiting any longer is like saying we shouldn’t have used the personal computer in 1985 until the smartphone was invented. Get behind the wheel of an electric car and you can never go back to the fossil fuel predecessors. But, this is just the beginning of a massive energy transformation. In “All-Electric America” authors S. DAVID FREEMAN, former utility CEO, and LEAH Y PARKS, a journalist in the electricity industry, explain how making the transition to an all-electric, all renewable society by the year 2050 is necessary, practical, and achievable. An energy infrastructure powered by the sun and wind & running on electricity, for all our energy needs, will be reliable, cleaner, safer, and CHEAPER. It will be superior to the system we have today and will lead to a better future. “The U.S. has some big problems that require bold solutions. 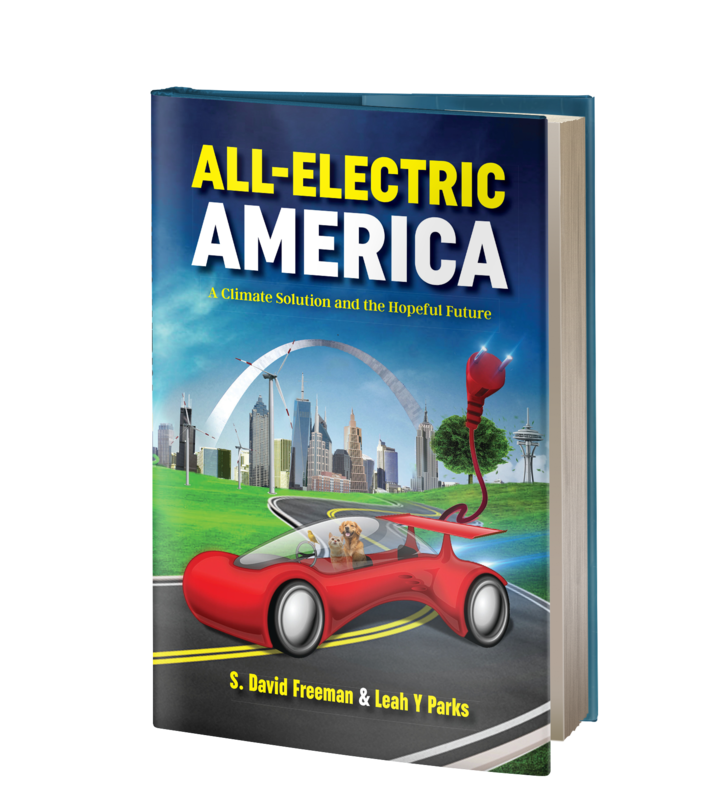 Unfortunately, books about solutions to our society’s problems are often given short shrift by reviewers or languish on our bookshelves…Now comes S. David Freeman… [All-Electric America] is scathing but optimistic, and manages to be bold while remaining pragmatic. Drawing on their combined years of experience, Freeman and Parks make the case for addressing the dangers of climate change with some concrete steps to counter our current downward spiral… When All-Electric America comes out in January of 2016 you will have a chance to make yourself knowledgeable about the real avenues available to us to transform our energy infrastructure for present and future generations by moving toward a new renewable energy economy.” – RALPH NADER, Consumer advocate, lawyer and author. “One cannot read this book without coming away with an optimistic belief that we, as humans, can handle this problem. Curing cancer and ending world hunger may be beyond us, but converting to an all-electric future can be done. We have the science and we have the policies, we just need the political will and the perseverance.” – R.F. HEMPHILL, Former Executive VP at AES & CEO of AES Solar Power Ltd.
“… David Freeman and Leah Parks have written a book whose importance cannot be understated and whose timeliness is critical… it is an inspirational book in that the authors show clearly not only why energy sustainability has to be the most important policy issue of our time, but ways to achieve it.” – DR. DAVID DUKE, Associate Professor & Head of Environmental and Sustainability Studies, Acadia University, Canada. “This is an excellent book. I strongly recommend reading it…” – KARL-FRIEDRICH LENZ, Professor of German Law, European Law and International Trade Law, Aoyama Gakuin University, Tokyo. “This book was a surprise and a revelation. What it does, no less, is propose in the strongest terms that America’s electric utilities do two things: (1) step forward boldly and supplant energy suppliers that fuel our buildings and transportation sectors, both of them high-energy use and high carbon emitting and (2) as quickly as possible, end use of fossil-fueled generation and replace it with renewable energy…Check it out… the strong vision of the role that clean electricity could play in sectors it has barely touched—buildings and transportation—is compelling.” – ROBERT MARRITZ, Publisher and executive editor, ElectricityPolicy.com and Electricity Daily. “All Electric America is an important piece of work that all of us should read. But, it’s also a potent reminder of David Freeman’s commitment to be in it for the long haul. With much work to do to overcome powerful interests intent on slowing progress; we could all do well to follow his example.” – ROB SARGENT, Energy Program Director at Environment America. It is time for the utility industry, politicians, and consumers to wake up to the opportunity that this energy transformation will provide. The resources currently allocated towards oil and other fossil fuels can instead be invested in the development of an all-renewable 21st century electricity infrastructure. Investments in coal mining, oil exploration, gas drilling, building new coal and gas plants, shipping and protecting oil, and fighting wars to protect oil interests will give way to a focus on building solar and wind energy, energy storage, and modernizing our grid. The clock is ticking. With every breath we take the Earth continues to warm. The specter of global warming requires that the transformation must begin immediately. Freeman and Parks show how, with the current “All of the Above” policy, we are, instead, on a path to climate hell. They present a course of action that gives us the best hope of eliminating disastrous climate change. Many are saying we need to achieve our global warming 2°C goal, but few are carrying out a real plan or fully understand the problem. Freeman and Parks evaluate the latest research, technology, and energy policy and lay out a comprehensive strategy with achievable goals and a clear timeline for when it must be done. We will need to replace all fossil fuels including coal, oil and natural gas used for electricity, heating, transportation, and industrial processes. They find that our only hope is to reduce our emissions by 3% each year for the next 35 years so that we reach zero emissions by 2050. Anything less risks severe climate disaster. David Freeman’s autobiography and a fascinating history of energy policy in America over the last 50 years. 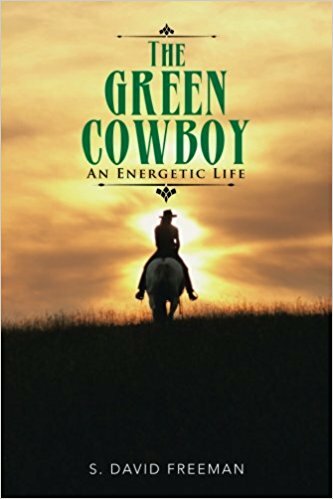 This book will inspire people to overcome early setbacks and live their dreams. It reveals that when you speak your mind, you can get bad people to do good things. A future is possible where all of our energy sources are powered with the free fuel of the sun and the wind, we live free of the specter of climate change, and one in which we are “Living Better Electrically". Let's Make It Happen Together!